Kelambakkam is a popular locality situated on the Old Mahabalipuram Road. It hasKovalam Beach on its east. Kelambakkam has very good connectivity with the other parts of Chennai. The Vandalur-Kelambakkam Road which passes nearby also plays a great role in the locality’s good connectivity with the rest of Chennai. The SIPCOT IT Park, located along the OMR, is one of Asia’s largest and is about 3km from Kelambakkam. The Park houses several reputable companies like TCS, Syntel, Cognizant Technology Solutions, and Hexaware Technologies, to name a few. Kelambakkam has a bus terminus and a Post Office. Kelambakkam lies at the junction of the East Coast Road and the GST road. The Kelambakkam-Kovalam Road, Vandalur-Kelambakkam Road and the OMR/also called the Rajiv Gandhi IT Expressway, connects Kelambakkam to the other parts of Chennai. The Tambaram, Chromepet and Potheri railway stations are all located close by. Chennai International Airport is about 34 km from here.Excellent road and rail connectivity has been responsible for the real estate development here. Average sale price for apartments range from Rs 3,400 per sqft to Rs 3,800 sq ft. Average price for a residential land in Kelambakkam is Rs 12,500 per sq ft. Some of the schools in the locality include Government HS School, St Marys Matriculation Secondary School, Bhuvana Krishnan School and many other schools. The SIPCOT IT Park also has the Chennai Mathematical Institute, a nationally acclaimed school of mathematics and physical sciences. Colleges include the Hindustan College of Engineering, Prof.Dhanapalan College of Arts & Science and some others offering various courses. Chettinad Health City and Jain Hospital are located close by and offer good medical services. The locality has several banks, restaurants, and departmental stores and shops across its length and breadth. 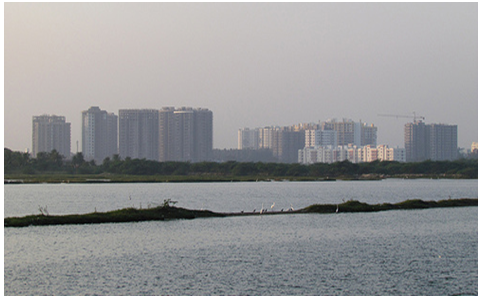 Kelambakkam also meets the needs of nearby villages like Velichai and Padupakkam. Kelambakkam is close to St Mary’s Church, TiruporurMurugan temple and the Sai Baba temple. These two places of worship see many people coming here to pay their respects. Looking to buy your new home or perhaps a good rental investment? RoofandFloor has great listings for projects in E-City. Your dream property is just a click away.